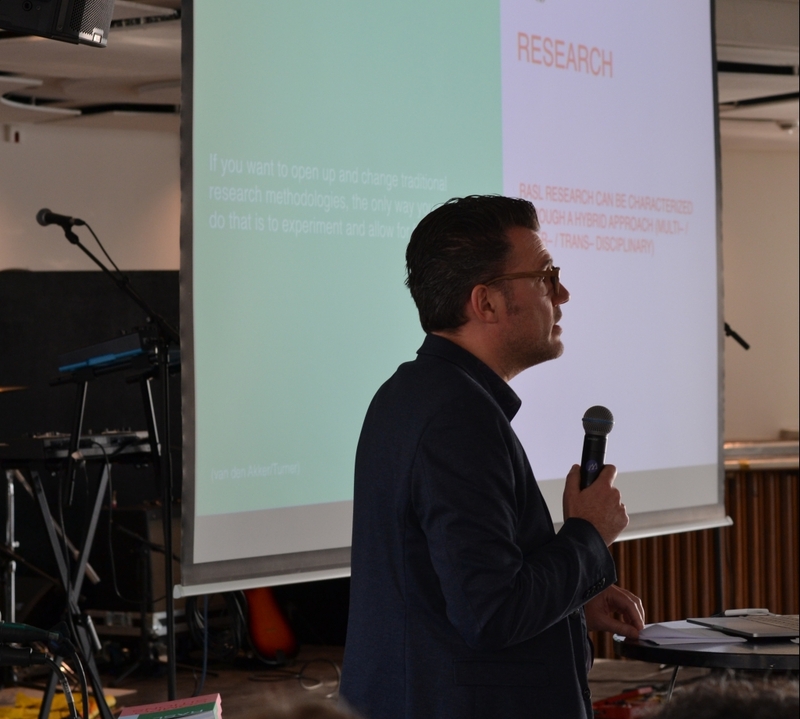 On November 21, 2018, Rotterdam Arts and Sciences Lab (RASL) had organised a symposium, hosted in BlueCity, a unique creative space in the heart of Rotterdam. 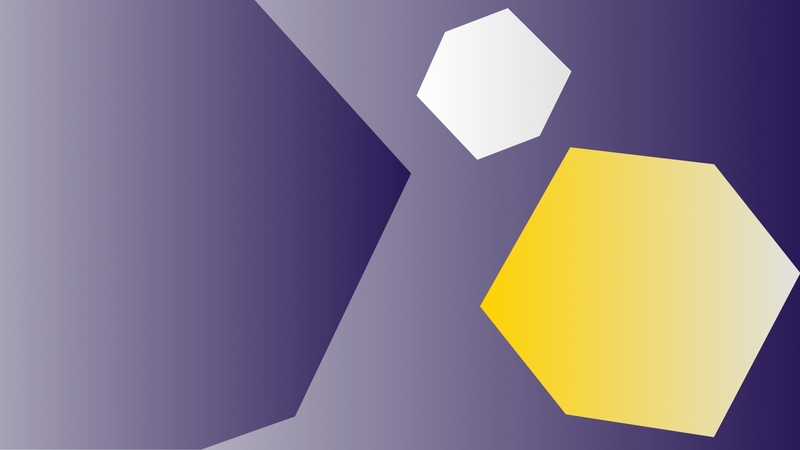 In this event we have shared insights gained from two years of transdisciplinary research and education, lessons learnt so far and plans for the future. 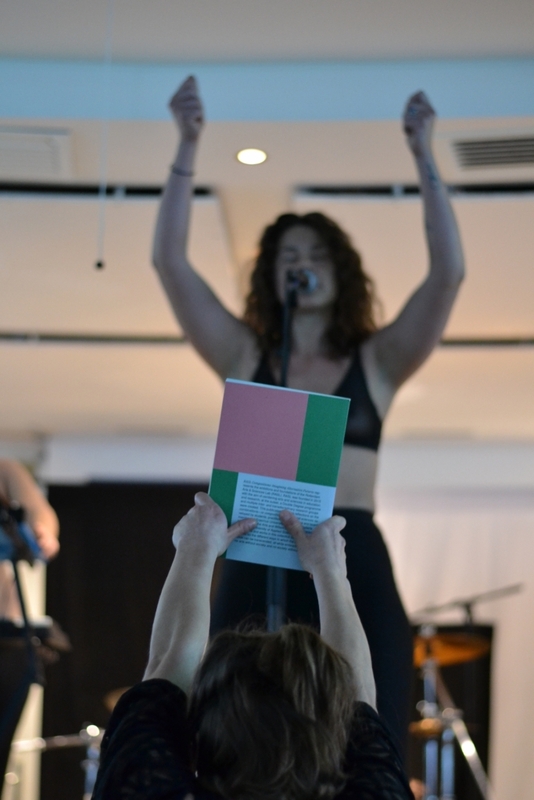 If you have missed the opportunity to participate in the event, read the extended review below, written by Amy Pickles (RASL Content Editor and a freshly graduated PZI Master Education in Arts) and Renske Wassink (Double Degree Coordinator and Policy Advisor for Codarts). Thank you to all who attended and participated in our first RASL Symposium. A thank you also goes out to hosts BlueCity, whose former subtropical swimming pool housed and heated our presentations, while cultivating tender conversations about working together, working on the edges and the vulnerabilities of trans-disciplinary research and education. 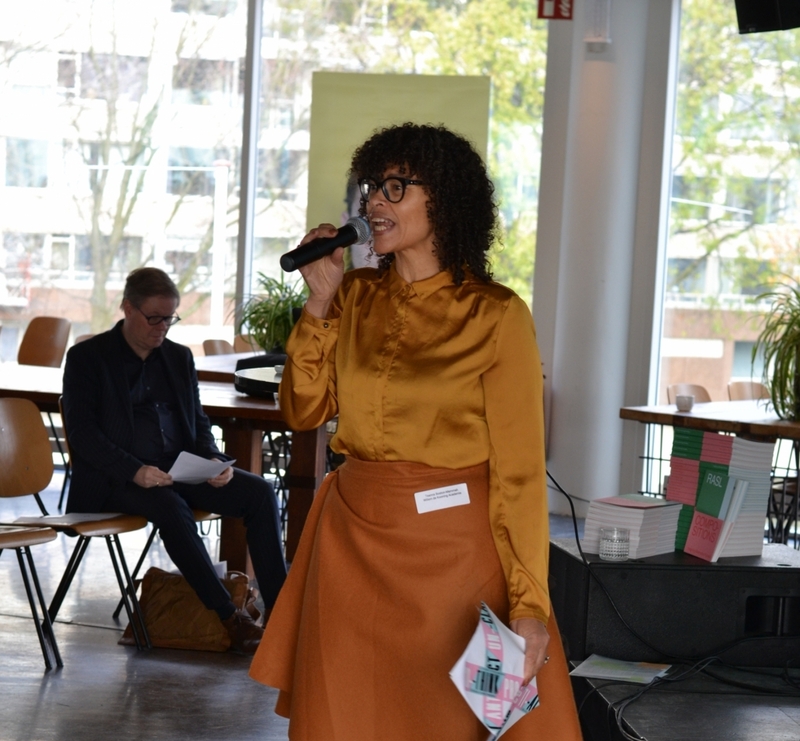 The most dynamic programme prepared for the visitors included a keynote by Marleen Stikker, Director of Waag, several interactive workshop sessions and a riveting musical performance by Club Gewalt. WdKA Core Team Tutor of Social Practices, Teana Boston-Mammah was our enigmatic MC, guiding us through the event with the perfect balance of sharpness and humour. RASL Co-initiator Filip Vermeylen opened the symposium and introduced our Keynote Speaker, Marleen Stikker. Stikker defines trans-disciplinary as “curiosity for cross-referencing”, and takes us through developments between art and science across both the institutional and public realm. 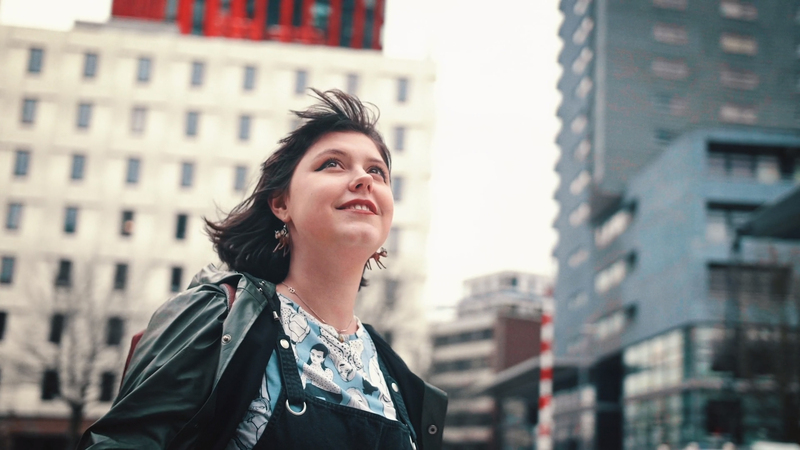 For Stikker, making things public “means making a larger picture of who is included”, a crucial act to maintain a practice that is relevant and useful to the world we inhabit. What to do with our data? And, in a time of datafication, what then is human? When, by 2040, 20% of all energy will be used by consumer technologies, what should we be making? Stikker reminds those of us working in the creative industries, that we should not sell things that are not good for us. The Keynote ended on the term Liminal, a word Stikker uses to describe where WAAG operates. Liminal means: "of, relating to, or situated at a sensory threshold" or "of, relating to, or being an intermediate state, phase, or condition: in-between, transitional". Stikker describes that operating in-between is uncomfortable. “The space is new, fresh and painful” but it is necessary to stay and work in the liminal realm. To think through why we turn to WAAG’s website finding its menu arranged: We make, We code, We learn, We care. Care should be a key factor in education. And, if the act of watchful attention we give when we care can cause us distress, then it is necessary to go to a point in education, and collaboration, that could cause pain. Roger Teeuwen (graphic designer and Head of School Design and Social Practices at Willem de Kooning Academy) extended this dialogue while recounting the three years of RASL. Roger had underlined that art and science can be united by the shared sentiment of Wonder. Does wonder exist in our sensory threshold and can this be another reason to work in the liminal? Roger Teeuwen (graphic designer and Head of School Design and Social Practices at WdKA) extended this dialogue while recounting the three years of RASL. 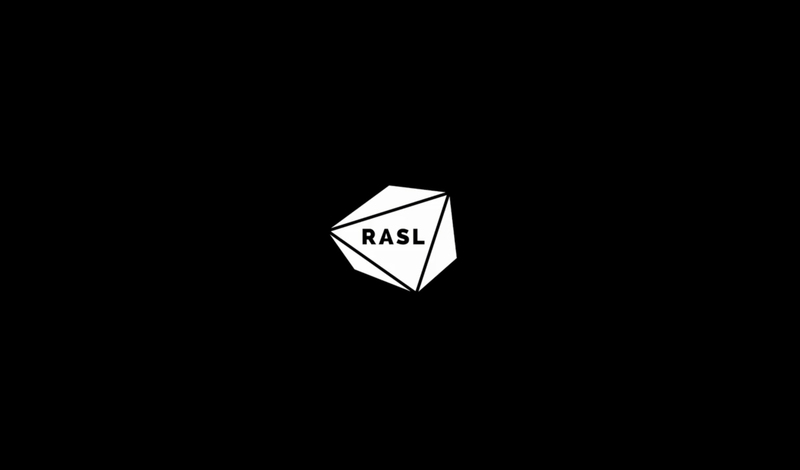 Teeuwen describes RASL as containing “pluralistic and complex knowledge structures”, and a structure that demands vulnerability for all those involved. As Stikker reminds us of the need to experience pain in order to develop, so Teeuwen enforces that moments of uncertainty and anxiety are necessary emotions to hold onto if we are to keep our wonder. Pain, vulnerability and wonder make us human. In the Q&A discussion that followed, issues around skills, tools and values had been raised. We need to work on our skills of interpretation. We need more tools, and they must be used to hold us accountable for our actions. We need to learn translation and we need to return to the public domain. It is time to challenge the notion of “winner takes all” that currently exists in our society, beyond an individual level, for difficulties lie within institutions as well. The beautiful RASL Compositions publication, designed by Studio Template was launched with an introduction by Wilma Franchimon (Chair of the Executive Board of Codarts Rotterdam), Dr. Liesbeth Noordegraaf-Eelens (Lector Education innovation at Codarts, associate professor at Education Innovation at Erasmus School of Philosophy), Renée Turner (Research Lecturer, Hybrid Publishing at Willem de Kooning Academy) and Jeroen Chabot (Dean of Willem de Kooning Academy). The launch was made official by handing over the publication to Director of VSNU Babs van den Bergh, Vice-director of the Vereniging Hogescholen Carola Hageman, Account holder Art Education at the Ministry of OCW Hester van den Blink and RASL student Jasmijn van der Linden. Liesbeth explained the choice of the word Compositions, and here we gain another definition. Composition is “the act or process of composing. Specifically: arrangement into specific proportion or relation and especially into artistic form”. The book is a compilation of essays into and around all that RASL is comprised of. Its online existence lives at publications.rasl.nu. The word composition was chosen as a way to express an importance in these texts to a reader; that we should perceive them as distinct parts while being able to form a whole. Work that is relational and pluralistic, is this an ethos for collaboration perhaps? Club Gewalt, Rotterdam based musical theatre “sing better than Mariah Carey”, closed the publication launch in wild, ritualistic style. 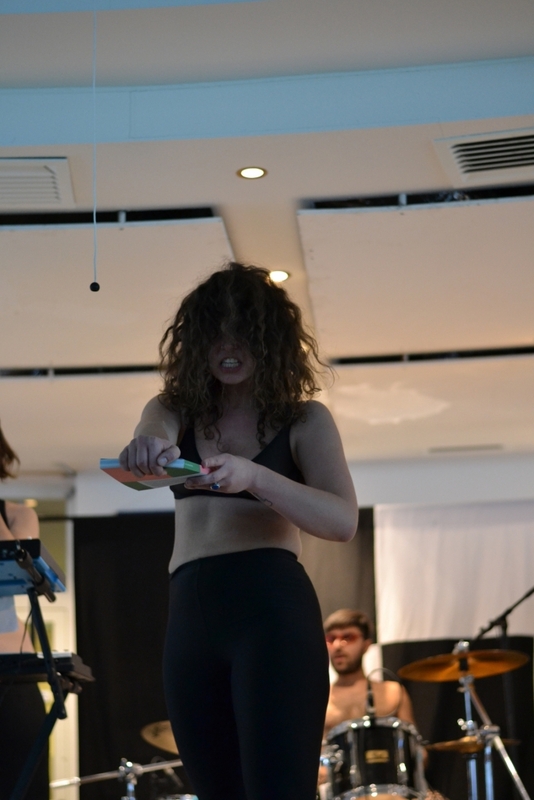 During which RASL Compositions went through a baptism of drums, guitar, mooing and mythical monologues, through an immersive performance with “overactive salivary glands”, and a clear love for the trans-disciplinary practice. 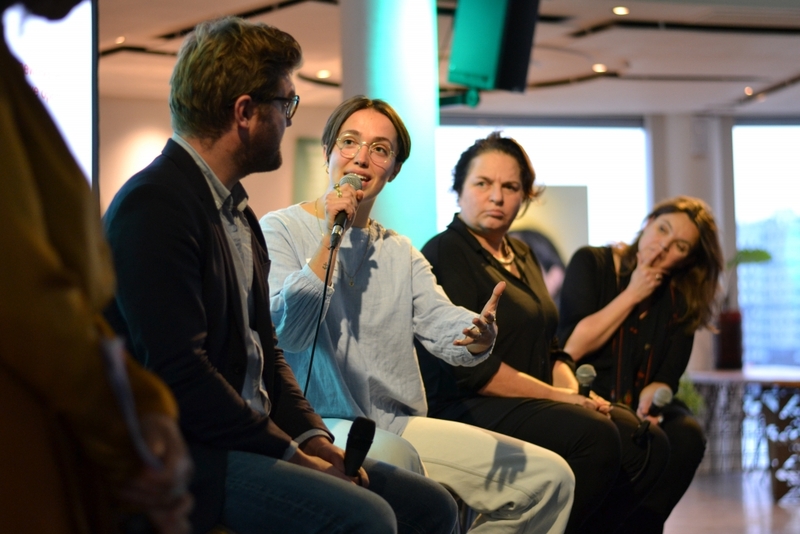 We digested this performance during the panel discussion with Marleen Stikker, Ellen Walraven (Artistic Director of Theater Rotterdam), Dr. Robin van den Akker (Erasmus Lecturer and part of RASL’s Research group) and Double Degree student Jasmijn van der Linden. Together they discussed what restricts research. Again, the issue was raised that the difficulties lie in the institution. Teana Boston-Mammah asked us if existing hierarchies within institutions torpedo these discussions, and we are reminded of the voices still to be listened to. 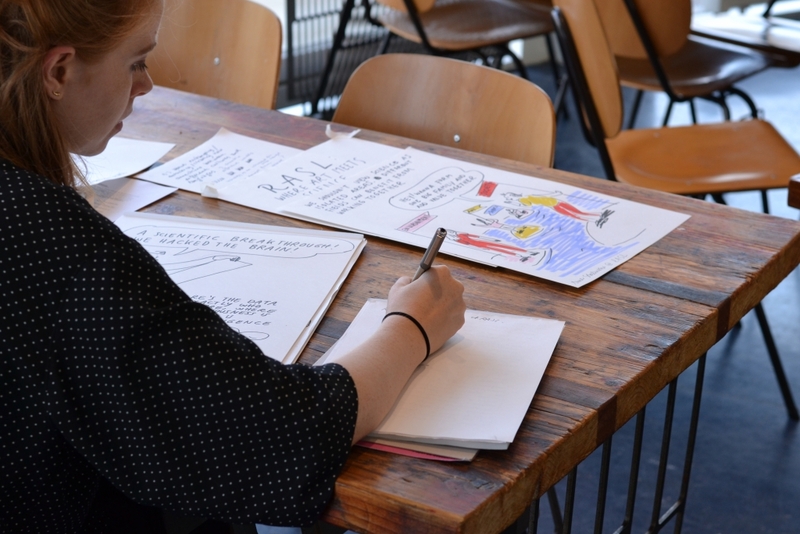 Listening is a crucial part of communication, an aspect of working together raised by RASL Course Coordinator Boo van der Vlist, who commented that while she frequently reads; the answer to a truly trans-disciplinary practice is to find a common language. Could we re-phrase that to find ways to communicate? We should take care to remember that, as Stikker notes, “we are actors not encouraged to speak in the same language”. We use language to exclude. Gloria Wekker is quoted, “Don’t agonise, organise”. A new way of communication had been organised in the symposium, all the while illustrator Anne Stalinski was drawing the action. Making the verbal, visual, is another way to express meaning. 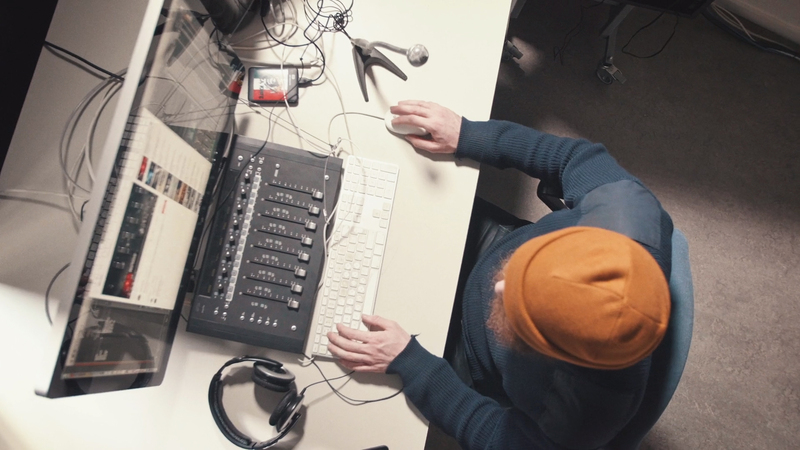 A trans-disciplinary practice should enter the public realm in many communicative forms. 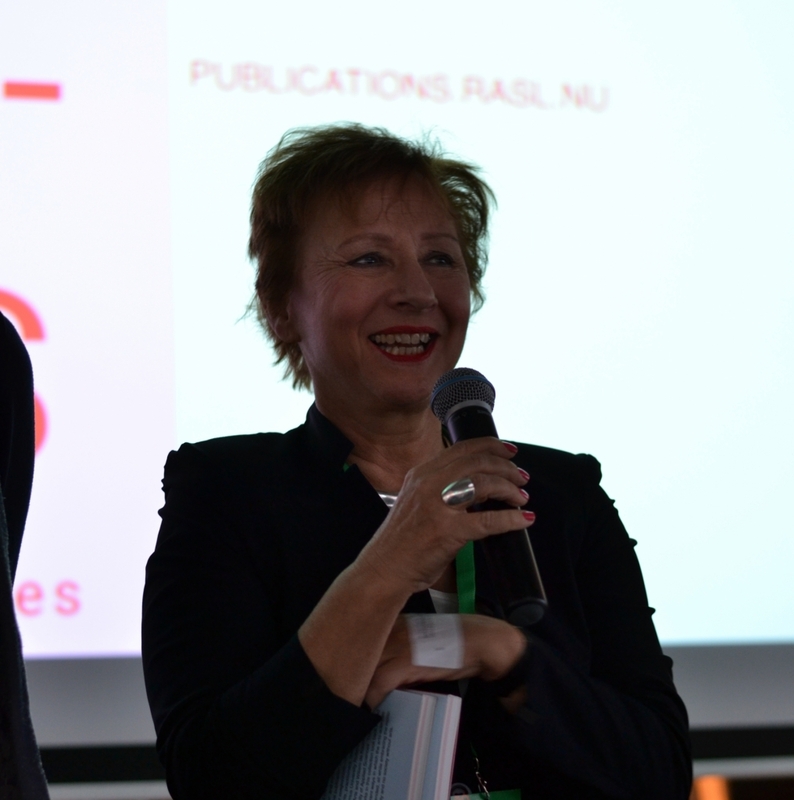 Wilma Franchimon closed the day with an appreciative and hopeful dialogue, confident that the incentives for initiating RASL – to forge new ways to work together and build bridges between disciplines – remain present in all RASL’s pluralities and compositions today. 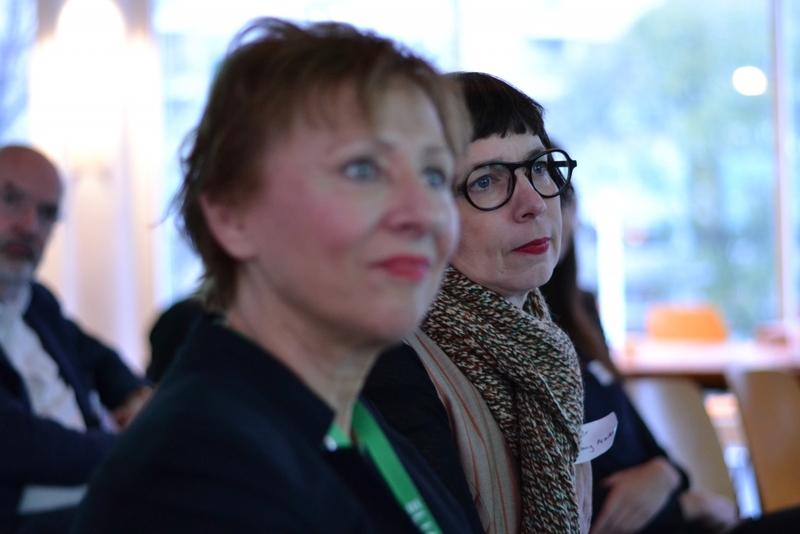 Amy Pickles is RASL Content Editor and a freshly graduated PZI Master Education in Arts, Renske Wassink is Double Degree Coordinator and Policy Advisor for Codarts.